For the first time snowmobiler to the seasoned pro, our fleet of touring snowmobiles are equipped with electric start, hand and thumb warmers, reverse and are suitable for 1 or 2 riders. To ensure warmth, complementary snow attire is available in all sizes (suites, boots and mitts). Helmets are provided and must be worn. All trips are accompanied by a trail guide instructor. Trail permits are provided and a drivers license is required to operate snowmobile. Travel any of the Muskoka and area trails. Get to Gravenhurst, Bala, Midland, Orillia or Barrie. This unique moonlight ride travels beyond the Swift Rapids to the Torrance Barrens, Dark Sky Reserve. With its brilliant display of planets and stars, the night sky can be the most beautiful sight on earth. Do you have any cabin openings for Friday the 27th? Hi there, I have a question about the goupon deal, with that deal does each person get their own snowmobile or is it the price for one as a passenger? The groupon did not specify. Looking a a weekend getaway at a cottage for snow mobile tours. For my husband and I for our anniversary for February . Travel one of central Ontario’s premier adventure travel destinations. Located just over an hour from Toronto, between Georgian Bay and Lake Couchiching, is the southern tip of the Canadian Shield and home to our wilderness base camp; For your outdoors recreation among thousands of acres of crown land. Enjoy Muskoka’s natural landscape and abundance of wildlife while visiting the Swift Rapids, Lock 43, and Trent Severn Waterway. We are providing a wide array of activities including riding ATVs or Snowmobiles, hiking fishing, sightseeing, bird watching, stargazing, canoeing, and camping. Located at the southern most tip of the Canadian Shield, this location offers stunning views from every turn in a rugged, natural environment with an abundance of wildlife perfect for families, friends or a romantic getaway. I am interested in a snow mobile tour( offered on groupon) but would like to stay over night do you offer anything like that? This would be a Christmas gift for my husband (newlyweds). The Swift Rapids and Big Chute Marine Railway (lock 43 & lick 44 of the Trent-Severn Waterway) is the Southern tip of the Canadian Shield, a land of rock, forest and deep clean water. This rugged, natural terrain has an abundance of wildlife for the enjoyment of friends, family or romantic getaway. Camp at our rustic cabins year round and get in touch with the great outdoors. Bring your camera and tread lightly. Offering ATVing, snowmobiling, hiking, fishing, sightseeing, bird watching, stargazing, canoeing, camping. The adventure is unlimited! New rustic Muskoka cabins in the woods. 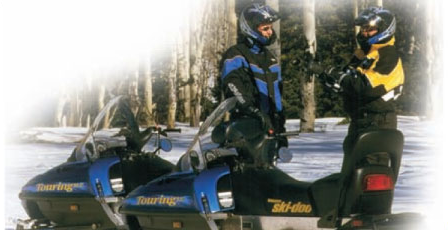 Guarantee Your Enjoyment, call Cottage Country Tours, a division of T Boy’s Toyz Inc.
Our snowmobile fleet consists of touring Ski-doo snowmobiles, that provide the best technology for your comfort. Machines are all equipped with electric start, hand and thumb warmers, reverse and are suitable for one or two riders. To ensure your warmth, complementary snow attire is available (suits, boots, mitts). Helmets are provided and must be worn. All trips are accompanied by a trail guide. Tours range from 1 1/2 hour introductory programs (morning, afternoon, moonlight rides) to 3 hour, Full day tours and overnights stays. Snowmobile rentals are available for experienced riders wanting to go on a self guided tour; Or for a weekend away with your snowmobiling friends. Hi i`m looking to come with a group of 8 people for the 1 hour snowmobiling activity and want to know if you have space available for the 27th December 11am tour. We are purchasing groupon`s and are only able to come that day so need to know if you have space for 8. We would like to do a 3 or 4 hour tour during the holidays.there would be 4 of us 2 per machine. What do I need to bring with me for the tour? Are there any requirements before I sign up? Send us a message with your desired activity type, arrival date and group size you'd like to reserve, and we'll contact you in no time.